Kayun Hostel Downtown i Kuta, Indonesien : Boka nu! 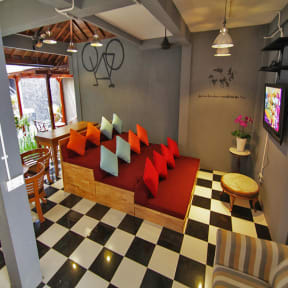 Kayun Downtown is the little sister of award winning Kayun Hostel. Once again bringing you the highest standards of quality, extraordinary design and ultimate friendliness. 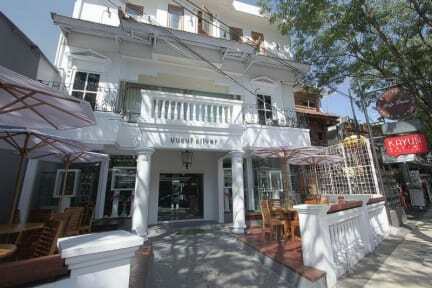 Located in downtown Kuta on Legian Street; it is steps away from the famous clubs, bars, and Kuta Beach. Everything is accessible and we provide an easy base point for you to explore the island. At the hostel, you can meet friends from around the world in our large common area, enjoy free WiFi anywhere in the hostel, dine at our cafe, or relax in our small plunge pool. Our super friendly and English-speaking staff will be more than happy to provide you with information about the island, assist you with tour bookings, on site motorbike rentals and arrange airport transfers. Not the cleanest hostel I've stayed in however the bathrooms are clean and the location is good. It's really close to the famous nightclub Skygarden if party is what you're after. Personally I prefer other citys to Kuta on Bali and we only stayed here one night, when we arrived at the airport late at night!